On March 22nd 2016, 2nd and 3rd graders from La Tierra Montessorri Charter school learned the hard work of cleaning the acequias, growing healthy food for our families, and the role of the Mayordomo. Students were accompanied by instructors Roger Montoya and David Garcia of Moving Arts Española, who are in the process of teaching the youth about acequias through hands-on activities, arts and music. They went to Sostenga Farm to learn more about acequia agriculture and modern extensions to farming. Sostenga farm is home to the farmer training program coordinated by the American Friends Service Committee. This year the NM Acequia Association is a partner on this training program and is integrating Sembrando Semillas youth and leadership development activities. Donne Gonzales and Noberto Armijo have been a part of the Sembrando Semillas program at NMAA for the past 8 years and now have an important leadership role in the farmer training program as Co-Managers at Sostenga farm. They are leading all of the planting activities, training new farmers, and engaging youth in acequia grown agriculture. For this visit, they broke students into groups to give them a tour of the green houses and a lesson on starters and how to harvest and prepare chard, kale and lettuce. They educated the students about the science behind the green house, the heat and humidity, and the importance of season extension. 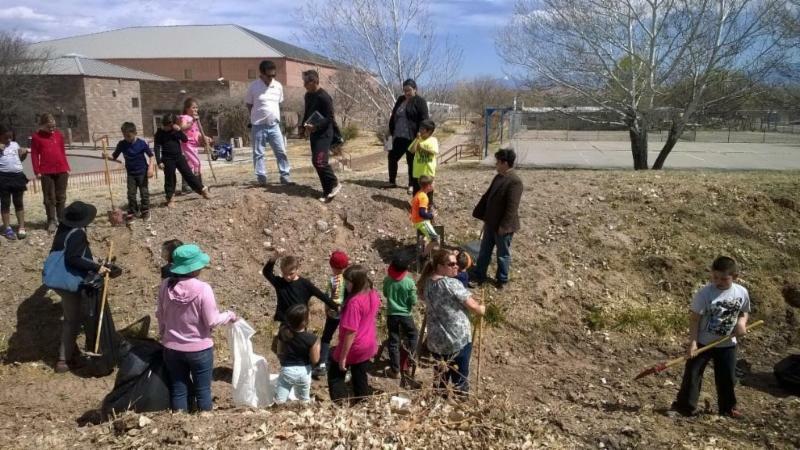 Lastly, they took an acequia walk to pick up trash along the easement. This inspired many questions and conversations about the role of the Mayordomo on the acequia and how important his or her role is in keeping the water flowing. Every student went home with a bundle of kale and a better understanding of the hard work their elders are doing to grow food and maintain the acequias! As part of an ongoing partnership, La Tierra Montessori Charter School will be taking each of their classes to visit Donne and Noberto at Sostenga Farm this Spring in an effort to help youth make a lasting connection to acequias, good food, and the agricultural heritage of our communities. Que vivan las acequias!! Que viva nuestra juventud!